"RIP" redirects here. For other uses, see RIP (disambiguation). The phrase "Rest in peace", RIP, from Latin Requiescat in pace (Classical Latin: [re.kʷiˈeːs.kat ɪn ˈpaːke], Ecclesiastical Latin: [re.kwiˈɛs.kat in ˈpa.tʃe]) is sometimes used in traditional Christian services and prayers, such as in the Anglican, Lutheran, Methodist, and Roman Catholic denominations, sometimes to wish the soul of a decedent eternal rest and peace in Christ. It became ubiquitous on headstones in the 18th century, and is widely used today when mentioning someone's death. The phrase dormit in pace (English: "he sleeps in peace") was found in the catacombs of the early Christians and indicated that "they died in the peace of the Church, that is, united in Christ." The abbreviation R.I.P., meaning Requiescat in pace "Rest in peace", continues to be engraved on the gravestones of Christians, especially in the Catholic, Lutheran, and Anglican denominations. In the Tridentine Requiem Mass of the Catholic Church the phrase appears several times. This verse has been found inscribed in Hebrew on gravestones dating from the 1st century BC, in the graveyard of Bet Shearim. It speaks of the righteous person who died because he could not stand the evil surrounding him. A recapture of these words, read as "come and rest in peace," has been transferred to the ancient Talmudic prayers, in a mixture of Hebrew and Aramaic of the 3rd century AD. It is used to this day in traditional Jewish ceremonies. Other variations include "Requiescat in pace et in amore" for "May she rest in peace and love", and “In pace requiescat et in amore”. The word order is variable because Latin syntactical relationships are indicated by the inflexional endings, not by word order. If “Rest in peace” is used in an imperative mood, it would be “Requiesce in pace” (acronym R.I.P.) in the second person singular, or “Requiescite in pace” in the second person plural. In the common phrase "Requiescat in pace" the "-at" ending is appropriate because the verb is a third-person singular present active subjunctive used in a hortative sense: "May he/she rest in peace." Although commonly associated with Christianity, the phrase is also used in Judaism. 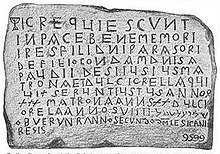 This ancient Latin inscription from 688/689 AD begins with a Latin version of the phrase. There is a menorah in the upper left corner and the Hebrew calendar date is in the lower right. The phrase was first found on tombstones some time before the fifth century. It became ubiquitous on the tombs of Christians in the 18th century, and for High Church Anglicans, Methodists, as well as Roman Catholics in particular, it was a prayerful request that their soul should find peace in the afterlife. When the phrase became conventional, the absence of a reference to the soul led people to suppose that it was the physical body that was enjoined to lie peacefully in the grave. This is associated with the Christian doctrine of the particular judgment; that is, that the soul is parted from the body upon death, but that the soul and body will be reunited on Judgment Day. In 2017, members of the Orange Order in Northern Ireland called on Protestants to stop using the phrase "RIP" or "Rest in Peace". Wallace Thompson, the secretary of the Evangelical Protestant Society, said on a BBC Radio Ulster programme that he would encourage Protestants to refrain from using the term "RIP". Thompson said that he regards "RIP" as a prayer for the dead, which he believes contradicts biblical doctrine. In the same radio programme, Presbyterian Ken Newell disagreed that people are praying for the dead when they use the phrase. This Lutheran Christian grave reads "Rest in Peace" in the local Cieszyn Silesian Polish dialect. Requiescat, oil on canvas painting by Briton Rivière, 1888, Art Gallery of New South Wales. Arabic: الله يرحمه‎ (Allah yarHamhu) for males, and Arabic: الله يرحمها‎ (Allah yarHamhaa) for females (More common, less literary than the above). ^ Langford, Andy (1 December 2010). Christian Funerals. Abingdon Press. p. 56. ISBN 9781426730146. ^ Catholic Prayers in Spanish and English. Harvard University Press. 1900. p. 45. ^ Leahy, Brendan (2012). His Mass and Ours: Meditations on Living Eucharistically. New City Press. p. 53. ISBN 9781565484481. Signs such as "RIP" (Rest in Peace) on the tombs of the early Christians didn't just mean they died "peacefully" but that they died in the peace of the Church, that is, united in Christ in the Church and not apart from it. ^ a b Mytum, H. C. (31 December 2003). "Christian Denominations". Mortuary Monuments and Burial Grounds of the Historic Period. Springer Science & Business Media. p. 139. ISBN 9780306480768. ^ a b Tarling, Nicholas (16 May 2014). Choral Masterpieces: Major and Minor. Rowman & Littlefield Publishers. p. 87. ISBN 9781442234536. ^ Expert: Maria - 7/31/2009 (2009-07-31). "Experts on Latin phrase". En.allexperts.com. Archived from the original on 2012-07-13. Retrieved 2014-04-17. ^ Spencer Northcote (1878). Epitaphs of the Catacombs During the First Four Centuries. London: Longmans, Green. p. 79. ^ The Church of England magazine. Church Pastoral-aid Society. 1842. p. 208. ^ Robert Jefferson Breckinridge, Andrew Boyd Cross. "Antiquity of the Religion". The Baltimore literary and religious magazine. 3. p. 206. ^ Gould, James B. (2016-08-04). Understanding Prayer for the Dead: Its Foundation in History and Logic. Wipf and Stock. p. 58. ISBN 9781620329887. Retrieved 2017-07-25. ^ Edwards, Rodney (2017-07-20). "Orangemen warned to 'reject Rome' and not use RIP on social media". The Impartial Reporter. Retrieved 2017-07-25. ^ William Crawley (2017-07-24). "Protestants should not use the phrase 'RIP', Orange Order says". BBC Radio Ulster (Podcast). Talkback. Retrieved 2017-07-24. Segment begins at 42:20 into the podcast, and ends at 1:00:11. ^ "Orange Order calls on Protestants not to use the phrase 'RIP'". BBC News. 2017-07-24. Retrieved 2017-07-24. ^ Thompson, Wallace (2013-12-15). "Why Protestants Should not Use 'RIP'". Truth Tracts. The redeemed do not need our prayers, and the lost cannot benefit from them once they have passed from us. We would be better to pray more for them while they are alive.